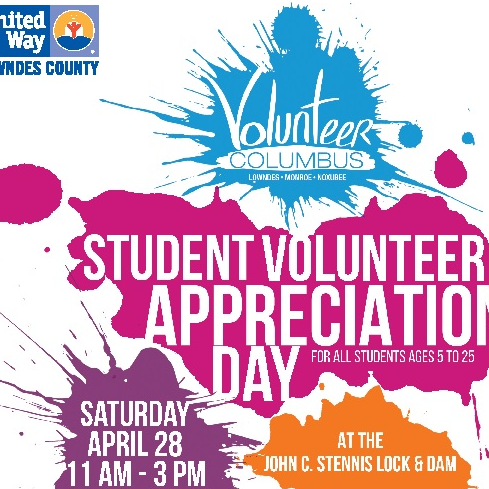 This is a way for the United Way Volunteer Columbus Center to say Thank-You to all youth ages 5 to 25 who have volunteered in their community (Lowndes, Monroe, & Noxubee) during the 2017-2018 year. There will be free food, music, animated characters, a water slide, as well as a set of inflatable jumpers for children. In addition, there will be an opportunity for groups, organizations, and individuals to volunteer. There will be 2 inflatables, one for older kids and one for younger kids. Volunteers will be responsible for monitoring children on the inflatables and helping children on and off inflatables. Also responsible for setting up and taking down inflatables. We need as much help as possible with cleaning up, and helping other nonprofits clean up their tables, booths, stations, etc. And help clean up any and all trash. Park must be left the way we found it. Volunteers are asked to come and paint children's faces. Paint and brushes will be provided. Volunteers are asked to paint girls finger nails. Log in to see who is volunteering for 3rd Annual Volunteer Appreciation Day !